is a fast moving and addictive card game. Spite & Malice is a very old card game. Also known as "Cat & Mouse," it's a form of competitive solitaire (patience). Match your wit and skill against Spite! The original SkipBo. Easy to learn to play, impossible to stop playing! SpiteNET: Spite and Malice can be played against Spite (resident computer opponent) or against a human opponent through the Internet (human not included). 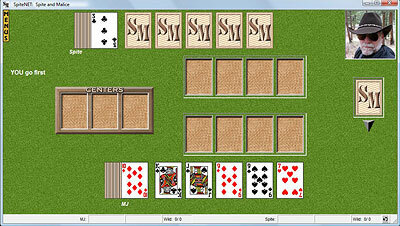 The Multiple Personality Edition lets you play Spite & Malice against 1, 2 or 3 computer opponents. Now besides having a cozy one-on-one game against Spite, you can choose a 3 or 4 player game adding a whole new dimension of fun to the game! There are 9 different opponent personalities which you can play against, each with their own spiteful comments and sounds. The computer opponents have three levels of card playing abilities - from Average to Ruthless and the basic game rules can be changed to your liking. SpiteNET can be played with standard picture playing cards, special tile or steel cards, or easy to read large number only cards. Read all about it by clicking the "How to Play" on the menu bar above. PLUS: Play SpiteNET: Spite and Malice against anyone with an Internet or LAN connection! How to Play - How do you play Spite and Malice? Click this link for game features, screen shots, game play instructions and rules, and a few helpful hints as well. The Multiple Personality Edition can help you with lots of split personalities to add to your game. On the NET - This card game with an attitude is now bringing that attitude to the Internet! Its easy to connect your registered game to another Internet player. Spite Fans - Just for fun! Chat live with Spite himself! Also player statistics, health benefits & stories, and wisdom from the Tao of Spite. System requirements, shareware information, licensing, file summary. More Games - More card games by SpiteNET! Click this link to try other great card games from SpiteNET! Treat yourself to Spites merchandise! Playing cards wall clock, t-shirts, mugs and more for the devoted Spite & Malice player. Download - Download the game! Download and try it out for free for 30 days. Warning: highly addictive! Only $15.99 -Order online with PayPal or credit card. Mail-in registration form if you prefer to pay by check or money order. Gift Giving - Give the gift of Spite to friends and family! Why should you be the only one addicted to playing? Get a quicker response by writing the correct email address for your question. Support - Technical help, FAQ, Download 101 for beginners, installation and registration questions. Om du vill spela Spite & Malice på svenska.